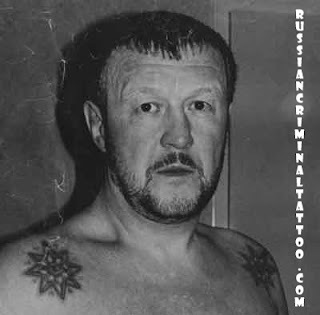 Russian,Criminal,Tattoo,GULAG,USSR,Prison,Russia,BMW,Criminal,Mafia,Vor V Zakone Blog about Russian Criminal Tattoo,Russian mafia, Russian Criminal Tattoo Photos,Meanings of tattoo,Vor v zakone,Stars,Criminal,Mafia,Eastern Promises Russian criminal tattoo: Big photo of Viacheslav Ivankov.Rarity. Big photo of Viacheslav Ivankov.Rarity. Found a big normal photo of Yaponchik.All photos what i saw in internet small like avatar.